I didn’t get to spend a lot of time with E today — D spent the night last night and we had two birthday parties to take T to today. After getting home from the second birthday party, I rushed to the hospital just in time for his 5:30 cares. He was very alert so we decided to try breastfeeding again. It went better than yesterday and he latched a few times, but he still isn’t really getting it, which is discouraging. The nurse thinks it’s fine, considering how eventful the past few days have been for him, but I’d be lying if I said I wasn’t worried that he might not ever get the hang of it. It’s a very common preemie problem. The good news is, the nurse said he had a pretty good day today, and he had a really great evening with me too. His breathing sounds clear and he doesn’t seem quite as bothered by the reflux as he had been. The nurse still had to suction him earlier this afternoon, but I have hope things are starting to look up. Weight dropped 12 grams, but that’s not surprising, with him on the diuretic. Still holding steady at 5 lbs 1 oz. This morning the doctor prescribed Emmett a prednisone nasal drop to help with the inflammation. He’ll take it twice a day for 7 days. They also put him on a fast-acting diuretic for two days, twice a day to help with lung inflammation and edema. If we don’t see improvement, may look into a longer-term diuretic. After a rough night last night, I was both looking forward to getting away from the hospital, and dreading leaving Emmett at the same time. The fact that Theo has swimming lessons on Saturday was a good excuse to get away. Sometimes I need that extra nudge to peel myself away. While I was gone, his breathing got so bad again that the nurse decided to suction him even though we’ve been trying not to as much because of the inflammation. It’s a good thing she did, because she got what she described as a “gremlin” from his nose that had formed a complete plug. No wonder he couldn’t breathe. She said she was so impressed with the size that she called the doctor in to take a look! Unfortunately, both his cannula and the feeding tube may be exacerbating his congestion. The feeding tube is giving all that refluxed milk something to cling to, and the cannula is blowing dry air in, which is basically the perfect recipe for monster boogers that are so far back in his nasal/throat area that they’re really difficult to suction out. We have some humidity on the cannula, but it’s still drier than if he were just breathing room air. The feeding tube also keeps his esophageal sphincter slightly open, which can exacerbate the reflux. Unfortunately, life is basically one giant catch-22 right now. 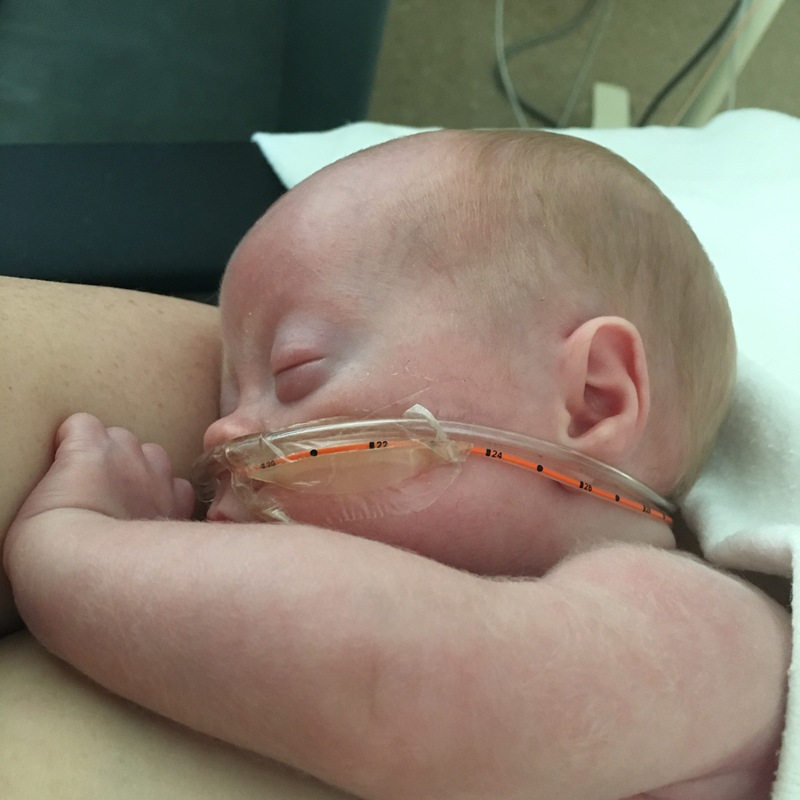 We can’t remove the cannula until he’s having fewer events, and we can’t remove the feeding tube until he gets the hang of breast/bottle feeding. But the reflux and difficulty breathing are inhibiting feeding and causing events. And around we go. We may try another round of systemic prednisolone, since he responded so well last time. If we do, they may try removing his cannula toward the end of the course while it’s still in his system. Meanwhile all we can do is try to keep breastfeeding him whenever he’s alert and hungry, but he’s working so hard to breathe right now that the nurse described it as like you or I trying to do aerobics and eat at the same time. Our attempt at breastfeedng today was a complete bust, so after about 20 minutes I just pulled him up into a kangaroo hold. Despite my disappointment over continued breastfeeding failures, he ended up having a really good rest of the afternoon. He was calmer than I’d seen him in a couple days while on my chest, and hardly had any desats. Those steroid drops really made a huge difference with his congestion, and while he’s still bothered by the reflux, at least he’s breathing clearly now. His weight was up 24 grams tonight, bringing him to 5 lbs 1 oz.